I haven't been blogging for all that long (a year and a half? ), but I have been so blessed by the friends I've made. One of those friends is Noelle from Jumpin-Beans. She's very kind and a lot of fun; I hope you'll stop by her blog and say Hi. So last week Noelle gave me this "Cherry on Top" award, which was so sweet that she made me cry! I don't know how to answer that question! On one hand, there are about a b'zillion things I'd do differently. On the other hand, the path I took--as rough as it was--brought me to where I now am. So I guess the answer is this: I wouldn't change anything, but I don't advise anyone else to do it the hard way, either! Alexis at Running Away? I'll Help You Pack. If you're not already reading their blogs, I hope you'll check them out! Your blog definitely does have the cherry on top. Congratulations. What a lovely award! Thank you very much for passing it on to me! I have to agree with your answer. This is the first time I've seen this one and I'm so honored that you chose me as one of the recipients. Thank you! 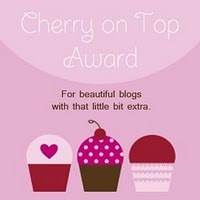 You definitely have a Cherry On Top blog. :-) I don't think I've ever heard of those others so I'll have to check them out. Thanks again.